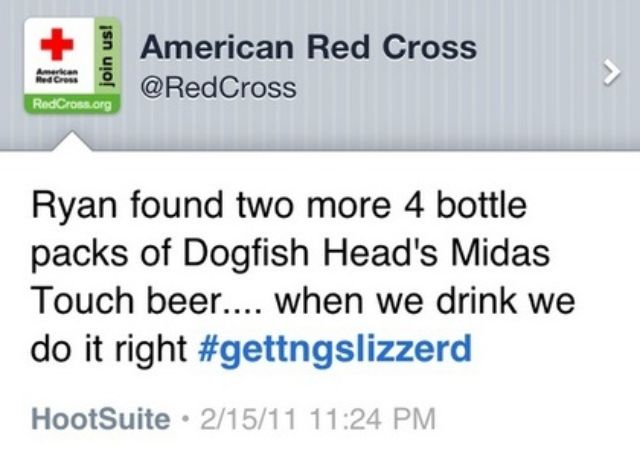 On February 15th, the @RedCross sent out an unusual tweet at 11:24PM with the hashtag #gettngslizzerd. No—there wasn’t a new emergency at hand although I’m pretty sure there are a few safety tips that the organization could offer to prepare the country for #gettngslizzerd. The only problem at hand was an accidental tweet that was meant to come from a staff member’s personal account. We’ve all been there. If you have control over more than one Twitter account, you know how difficult it can be to keep your tweets, audiences and mentions separate. Whether you use Tweetdeck, Hootsuite or another multi-network platform, keeping more than one account updated and conversational takes skill. Any company should take note of how the Red Cross handled this small social media fiasco. When Wendy Harman, Director of Social Media, received calls about the tweet in the middle of the night she immediately took it down. However, everyone knows that when you delete a tweet, it still lives on in the Twitterverse and when you have the reach of the Red Cross, word spreads fast. Not only did the Red Cross apologize for the “rogue tweet” but they handled the situation with humor. The Red Cross took their mistake a step further by writing a quick blog post that acknowledged their mistake. In it they recognized that while they are “a 130 year old humanitarian organization”, they are still “made of up human beings”. This Twitter faux pas is a valuable lesson to all companies who believe that deleting a tweet or Facebook post is enough to hide the damage. The social media world understands that no one is perfect but they will notice if you are not responsible for your mistakes. Dog Fish Beer has also been a huge help to the Red Cross by actually encouraging donations. The online beer community has been rapid to comment with light-hearted jokes about the situation. This is a great lesson in crisis communications—Don’t make a problem bigger than it needs to be. 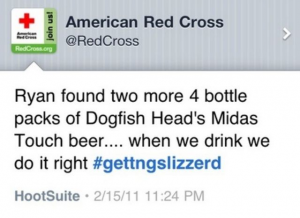 Tweeting about drinking beer from the Red Cross account was a simple mistake that could happen to anyone. Granted, it was unfortunate that it happened on an account that has significant reach and is seen as a news source to the public. But we are only human. I can see how this example could scare some companies away from embracing social media. There is no control on the direction dialogue takes after a tweet is posted. However, this example shows that if handled correctly, a mistake can actually turn into a blessing in disguise. The social media community is forgiving by nature if they believe that the company/organization has good intentions. And now there is further awareness to the fact that the Red Cross needs blood donations. See how a mistake can turn into good? Now that the largest humanitarian organization in the world has mistweeted, its time to own up. Have you ever tweeted from a client/organizations account when you meant to keep it personal? Share your story because let’s be honest, it really is funny. My biggest mistake? As a Red Cross communicator for the Chicago chapter, I checked into Popeyes from the Chicago Red Cross account with the caption: “In a cab. In the drive through. With Rob & Trifon.” And yes, this went to both Twitter and Facebook and unlike the National Red Cross, I did not put out an apology for my mistake. I’m sure there are still some followers who are confused as to why the Chicago Red Cross was being completely lazy by picking up fried chicken in a cab. And for that, I am truly sorry. 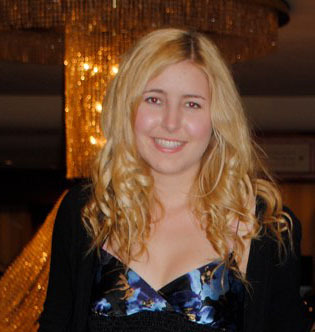 Lauren Snyder is a sophomore at DePaul University in Chicago with a major in Public Relations. She currently is the Communications and Marketing intern for the American Red Cross of Greater Chicago where she is working to advance digital efforts and promote the Holiday campaign. She is graduating college a year early to jump into the industry and move to New York City to completely destroy any evidence of her former “Maryland farm girl” background. Connect with her on her blog, Twitter or email.